Copycat Success – I did, the day I sold the MCG. 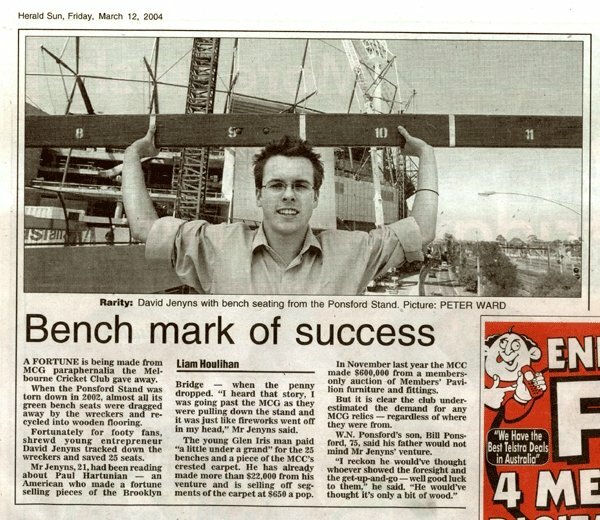 The day I sold the Melbourne Cricket Ground (MCG). It all started back in late 2003 as I was driving through Richmond, Melbourne. At the time there was a complete redevelopment being done on the MCG Ponsford stand. A story I had just been reading about a guy called Paul Hartunian – an American who made a fortune selling pieces of the Brooklyn Bridge – was fresh in my mind. To cut a long story short, Paul got his hands on the discarded wood from the Brooklyn Bridge renovations. Then, after distributing a press release with the headline “New Jersey Man Sells the Brooklyn Bridge… for 14.95”, he went ahead and cut the wood into pieces, sticking them to a homemade certificate. Paul went on to make over 1 million dollars selling his $14.95 certificates! As I was saying… I was driving past the MCG and I’m sure you can imagine, thinking about duplicating Paul’s success, it was like fireworks started in my mind. Almost immediately I hopped on the phone, tracked down the wreckers and scored myself all the discarded MCG wood and carpet I could get my hands on. Following in Paul Hartunian’s footsteps I sold the MCG… watch the video below to see what happened next. – How another young entrepreneur beat me to the punch. – How the Herald Sun newspaper stodged me. – and why the MCG sent me a cease and desist letter. The astute reader will come to see there are many lessons to be learned in my stories. The takeaway insight here is: “It’s ok to copycat your way to success.” Not only is it “ok”, I think it’s one of the smartest things you can do. In fact, I use a technique called “modeling”, a method of learning that occurs as a function of observing, retaining and replicating patterns of language and behavior observed in others. But more on this another day… NOW GET BACK TO WORK! So, if you’ve given no refunds yet, are the buyers all miserable? I suppose the lesson here is you don’t need to be perfect to make lots of money. If the product is good, people are generally very forgiving. When I read this I couldn’t help but blush… A good friend recently sent this out to his subscribers. Norman Hallett here from TradingMind Software. I think he got so smart by immersing himself into the world of trading and applying his natural “sharpness” to making money in the markets. He’s like* the “question man”* and he is continues to associate himself and get “next to” some of trading’s top players. He’s always the guy standing in back of or next to the famous trader. He’s in the shadows… learning. I’ve known David for 4 years now (since he was 22) and he’s just getting more and more refined with each conversation I have with him. I show you this little clip to make the point that you can’t teach brilliance. You see, in my opinion, a brilliant person can apply his brilliance anywhere and create terrific outcomes…. and David in the last few years, he’s turned his attention to trading. In fact, David is about to come out with a trading course which he co-authored with seasoned trader, Stuart McPhee (David’s still mostly in the shadows). I’m in the middle of reviewing the course now and I’ve noticed 2 “brilliant” things already… the emphasis on being a total trader (mind, money management, trading plan) AND the course going to be* affordable to EVERYONE*. But for now, David and Stuart set up a page with a few MP3 downloads of some Q and As they did between each other (questions supplied by traders like you and me). I know I don’t have the time to get through the 4 hours of Q and As they posted (and probably neither do you), but I DO recommend clicking on the first interview and listening to* the first 5 minutes* just to get the “taste” of how different these guys are in their hype-less approach. And I think you’ll get a taste of David’s brilliance as he interjects a point here and there between seasoned Stuart’s comments. I’ll comment more on their course when I’m done viewing all the CDs… but so far, so good.